Beginning artists often seek art painting tips on how to improve art skills. The secrets to creating good art. The secrets to creating just the right colors. Secret painting composition tips that will make a subject more exciting. I mean, there must be secrets to this, right. Otherwise everyone would know how to do it. Well, let me plant a couple thoughts in your mind. Think of them as essential painting ideas for beginners. First, let's start with a couple things that are easy to do but make a very real difference. Most subjects you want to paint have been painted thousands of times before by thousands of other beginning artists. Fruit, flowers, trees, mountains. Been done a zillion times. Since that's the case, what can you possibly do to make your paintings different and better than those thousands of others? One of the simplest and easiest art painting tips to make your paintings begin to stand apart is to more tightly focus them. Too often I see paintings where the star of the art is surrounded by a lot of empty space. Or a lot of uninteresting background. Something just thrown in to fill the space. Whatever the subject, everything inside the borders of your art should have an intention behind it. So focus on your stars. One very simple, but often overlooked, art painting tip is to move in closer to your stars. Eliminate unnecessary space. And then you can use simple tonal or color changes to add interest around the stars. In a still life you control the lighting and composition. Take the time to thoughtfully arrange and light the objects in it. Thoughtful and conscious intention is how to improve art skills. Even when your subject is Mother Nature. It is rare that a scene you photograph is perfectly composed and lit exactly the way you want it, and all you have to do is paint what you see. It is so much more fun and satisfying to create the excitement you want to see. Using the same painting composition tip as before, you can often create more excitement by coming closer to your subject. 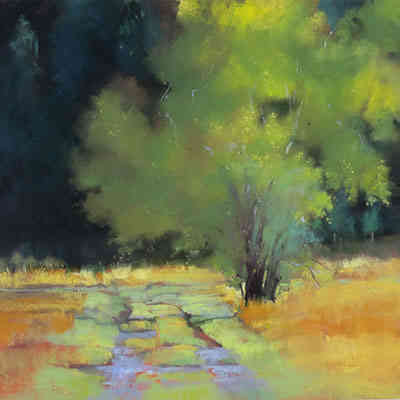 That’s exactly what Jan Wall did in this pastel painting. She focused on one tree. Using simple color changes she made it visually interesting. Even though there were probably other trees around it, she knew she didn't need to show them. Some dark tonal changes in the background supply just enough variety. The tree and the foreground are what are important here. Sometimes it only takes a few simple little steps to create magnetic art. P.S. One of the big take-aways from this week's post is this. You can make your art and your life harder by looking for complicated art painting tips. To improve your art skills, start with the simple things first. Move in closer. Focus on your star. That eliminates what may be unneeded background space. Then, make the background area you do show simple and just interesting enough to complement your star.